Before 1661: Shôzaemon performed in Kabuki dances in Kamigata. 1661: due to the decline of Kabuki popularity in Kamigata, a group of actors, including Tamagawa Sennojô I and Shôzaemon, decided to go to Edo. 4th lunar month of 1663: Shôzaemon, along with Ukon Genzaemon, Tamon Shôzaemon I and Saitô Yogorô, was invited to perform at the Edo mansion of the daimyô Matsudaira Yamato-no-Kami . 11th lunar month of 1663: Shôzaemon performed at the old Hinatadayûza in Edo, along with Tamon Shôzaemon I, Umeda Mon'ya and Takeda Sagami. 11th lunar month of 1665: Shôzaemon performed in Sakai-chô, along with Bandô Matakurô I, Tamon Shôzaemon I, Tamamura Kichiya, Imamura Kumenosuke, Dekishima Kozarashi I, Umeda Mon'ya and others. 8th lunar month of 1666: Shôzaemon performed in Sakai-chô, along with Bandô Matakurô I, Tamon Shôzaemon I, Tamagawa Shuzen I, Tamamura Kichiya, Imamura Kumenosuke, Dekishima Kozarashi I, Umeda Mon'ya, Hashimoto Senkatsu and others. 3rd lunar month of 1667: Shôzaemon performed in Sakai-chô, along with Bandô Matakurô I, Tamon Shôzaemon I, Tamamura Kichiya, Imamura Kumenosuke, Dekishima Kozarashi I, Umeda Mon'ya and others. 12th lunar month lunar month of 1668: Shôzaemon, along with Nakamura Chôjûrô, Hanai Saizaburô I, Sakurai Mon'ya, Imamura Kumenosuke, Matsushima Ichinojô and Sakuya Kuhê, was invited to perform at the Edo mansion of the daimyô Matsudaira Yamato-no-Kami . 1st lunar month of 1670: Shôzaemon performed at the Nakamuraza in the dance "Ichi-no-Tani Onna Musha". 6th lunar month of 1674: Shôzaemon performed as a tachiyaku in Kyôto at Ebisuya's theater; his stage partners are Fujita Koheiji, Kaneko Rokuemon, Imamura Kumenosuke, Fujita Minanojô, Nanboku Sabu I, Nakajima Yaheita, Itô Kodayû II, Tamagawa San'ya, Dekijima Tanomo and Kumamoto Bun'emon. 5th lunar month of 1675: Shôzaemon, along with Yamamura Chôdayû III and 21 others actors , was invited to perform at the Edo mansion of the daimyô Matsudaira Yamato-no-Kami . 9th lunar month of 1675: Shôzaemon, along with Yamamura Chôdayû III and 48 others actors , was invited to perform at the Edo mansion of the daimyô Matsudaira Yamato-no-Kami . 1684: Shôzaemon was recorded as living near the theater managed by Ichimura Takenojô I in the district of Fukiya-chô. 1st lunar month of 1693: Shôzaemon was recorded in the illustrated book "Kokon Shibai Irokurabe Hyakunin Isshu". No record in Edo or Kamigata afterwards. He most likely performed in Nagoya. Komai Shôzaemon was a 17th century Kabuki performer, who was active from the 1660s to the 1690s. Born and trained in Kamigata, he made a fame for himself in Edo. He was an outstanding dancer, excelling in komai or hyôshimai. His stage name came from the komai style of dancing. Among these 21 performes were Imamura Kumesuke, Yamamura Katsunojô, Matsumoto Kogenji, Matsumura Gengo, Shinozuka Hanbê and Komai Kuhê. Among these 48 performes were Miyazaki Denkichi, Abura Kanroku, Imamura Kumesuke, Yamamura Katsunojô, Matsumoto Kogenji, Otowa Sennosuke, Sagami Yagorô, Saitô Jûemon, Nagashima Sannojô, Morioka Sanzaburô, Matsumura Gengo, Suzuki Heiemon and Sawada Hachiroemon. 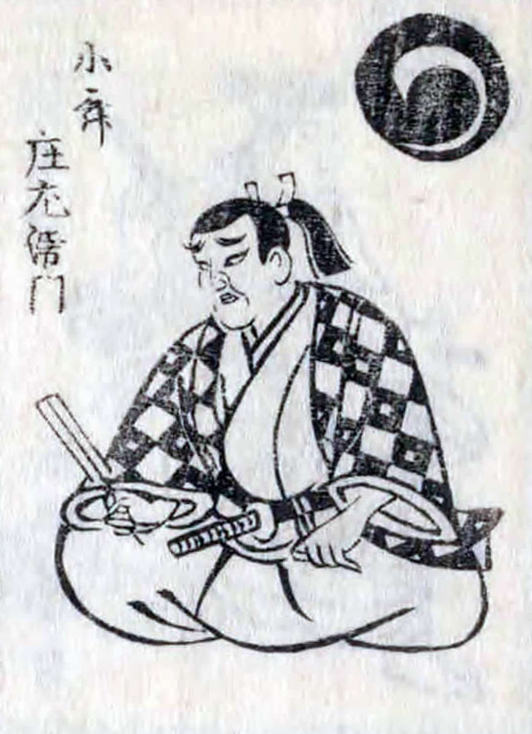 Komai Shôzaemon in an ilustration from the book "Hana no Edo Kabuki Nendaiki"